One scenario theme and 5 quite different systems. This post takes a scenario from the first ASL starter kit and uses it as a basis to play that type of action with five different tactical systems. Please click on 'read more' to see the rest of this post. I have chosen a Starter Kit #1 scenario so that we exclude both vehicles and artillery from play and do some bare bones gaming, showing each system off at its most basic level. This is more fun than anything else, just to see how play flows differently from game to game. The article would just be too long to do an in depth analysis, so please, no angst if your favourite system falls victim in anyway to this 'light touch' approach. In some respects as we are using the ASLSK scenario as our benchmark and as this was specifically written for ASLSK as a balanced scenario, it may put the other games at a disadvantage in showing off their glory. ASLSK scenario S2 - War of the Rats. The situation is based in Stalingrad, September 1942. The initial armoured thrust into the city had failed and the campaign turned to an infantry battle. 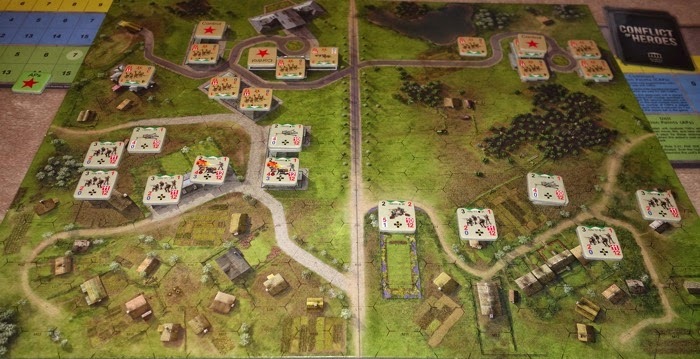 The Germans are the attackers and to win they must control three designated (multi-hexed) buildings by the end of the game (six turns). The only special rule is that the German 5-4-8 squads (Elites) have their Smoke Exponent increased by 2 (i.e. they can place a smoke counter, while moving, on a die roll of 4 or less). Russians, 5 x 1st line units and 5 x conscripts, 3 leaders, 1 x MMG and 2 x LMG. On turn 3 the following reinforcements arrive, 3 x sub-machine gun squads, 1 good leader and 1 x LMG. Germans, 4 x elite, 7 x 1st line, 4 leaders, 1 x MMG, 3 x LMG, 1 x flamethrower and 2 x Demolition Charges. The firefight takes place in a city setting, where there are plenty of stone buildings, but importantly there are three multi hex buildings in the Russian lines which will be the objectives. The Germans are the attackers, setting up in buildings on one side of the Road, whilst the Soviets set up in buildings on the other side. The Germans will need to cross that road and some open ground to get into close combat situations and physically wrest the objective buildings from the enemy. Playing with ASLSK #1 (Multi-Man Publishing) - This plays on a half size board (9" x 11") giving a hex field of 15 wide by 9 deep, so it is a compact game, but gives enough hex locations for plenty of tactical variety. The outcome of this game - The scenario is nicely balanced. I played the scenario three times before writing this and each time I had quite different openings. During the most recent game, the flamethrower broke down instantly and later a light machine gun broke down and was repaired in a later turn. Also the Russian conscripts gave some first line Germans a bloody nose during close combat. I found that this level of detail was rewarding and helped give an engaging narrative. I still found myself diving into the Defensive Fire rules just to check that I was doing something right, but in some ways this level of play intensity does connect you closely to what is happening on the board and it leaves you caring about what is going on in each hex. Everything feels purposeful, there is nothing generic or bland. Components - The infantry counters are half inch and easily read, though I struggle a bit with the vehicles (5/8ths size and not actually used in this article) as both model type and the armour values use a very small font. The maps although now based on an almost 40 year old style, remain attractive, very functional and I like them. The terrain layout gives enough space for squads to breathe and be a little individualistic, rather than looking like a clump of squads. Firepower - This is the CRT that we all grew up with. The system uses 2D6 that can deliver some effective fire, especially as squads can combine with other squads to form fire groups and can also augment their firepower with an array of support weapons (generally machine guns). The dice are two coloured with the 'red' dice also also acting as a randomiser to govern whether multiple rate of fire weapons (guns and machine guns) retain their ability to fire again in that turn. In a full turn, units get to fire twice (Prep Fire and Defensive Fire), so in a 6 turn game, quite a lot of firepower can be put down. Leadership - Leadership is represented by individual leader counters and they essentially enhance a squads ability to move further and to fire more effectively. Critically, they are essential in rallying broken units (see casualties), but in all cases mentioned, the leader needs to be in the same hex as the unit it help. This concentration of command works well for fire and movement but can be frustrating when broken units start to get scattered around the place. There is some self rally capability, but its limits can make command and control feel a bit disjointed across the board. Casualties - We have units breaking under fire and becoming useless until they rally and also the real effects of casualties as squads get replaced by half squads or get removed from play. Broken units are pretty much useless and vulnerable and in the main need to be rallied by a leader. Isolated units can often be left to languish in their broken state for the lack of a leader to rally them. Complexity now and future - To play this scenario the player needs to read the full 12 page rule set, which while designed for beginners, still has a lot going on and the first few games will likely require a lot of rule referencing, with the Defensive Fire mechanism part of the rules perhaps taking the longest to become second nature. There is a lot that can happen in a turn, so it might take two or three games before the player even remembers to bring all the rules into play, though the player should persist because this first module does become second nature to play and results is some rich tactical gaming. The other games being looked at here contain their full system in the base module, usually in 20 pages or less, but ASLSK #1 only looks at infantry and the system becomes increasingly complicated as one moves on from infantry and starts to include guns, tanks and artillery that come in the later modules. Opportunity fire - When units opportunity fire, they leave a half fire strength marker in the target hex (Residual Fire). During that phase, any other unit that moves into the hex will be immediately attacked by that fire strength. ASLSK is the only system here doing that and it does add a nice touch that brings real nuances and narrative to play. Units might be able to opportunity fire more than once and explaining the several situations during which this can occur, leads to the Defensive Fire rules being frequently checked up on during play. Support weapons - This is a strong area for ASLSK with quite a variety of kit that is attached to specific squads and half squads. Support weapons include demo charges, flamethrowers and light / medium machine guns. Weapons can break down when firing and might also be repaired at some point in the game. The weapons have their own rule sections, highlighting any unique character, such as a unit carrying a flamethrower when fired upon itself suffers a modifier reflecting the risky nature of carrying the fuel tanks. Flamethrowers also breakdown easier (on a 10 or more) than other weapons, reflecting their fuel running out. It is this sort of thing that makes this system so flavoursome. Rout - There is a Rout Phase to deal specifically with the movement and survival of broken units. Players will want get broken units out of the enemy line of sight as they are vulnerable to reduction if hit again while broken and also can pay a huge +4 penalty when attempting to rally. A lot of these rules have been with the system since the Basic Squad Leader days, so have stood the test of time. Close Combat - Combat is simultaneous and units in the stack get a chance to form into various combinations for attack and results can be an instant clearing of the hex, but commonly, the CC continues into a second turn, giving more opportunity for new units to feed into an ongoing Close Combat. Typical of ASL(SK), CC goes one step further in adding flavour (but also complexity) by having units test when they first enter Close Combat in buildings or woods to see if one side can ambush the other. If a side does ambush the other, they get to fire first instead of simultaneous fire. This is just another little rule that adds detail, but as admirable as all this details is, some of it seems unnecessary and it is the cumulative effect of these sort of secondary little rules (over several modules) that for me, starts to put pressure on the system as being overly done. Order of Battle - It is the best of the games here in this regard and that remains true as you get deeper into the system. Unit characteristics are strongly demonstrated as part of the high flavour of the system, so even in this most basic of scenarios, we have conscripts, 1st line units, sub-machine gunners and elites and each of those squads can break down (casualties) into half squads and also degrade down into lower grade troops, so under pressure, a 1st line counter might be replaced with a 2nd line counter with lower values. In addition, for players who move deeper into the system, there are very full orders of battle given for many nationalities and theatres of war. The scenario range is potentially huge. The game produces a strong relationship between the player and the game pieces at an individual level, in part, due to these unique characteristics and by comparison some of the other systems can feel noticeably bland in this regard. Terrain - The two maps in the base game are building heavy (which I like) and one also has a mix of fields, woods and open ground. The boards in subsequent modules do bring extra variety such as hills (and polder in the campaign game), but modules 1 - 3 in the starter kits have not given us hedges or walls, which I like to see in a tactical game. Their absence is noticed. There is playing space within the terrain on the boards, giving units room to breathe, games generally do not feel constrained by the board edge, even when a scenario only plays on a half board. Solitaire - The base game plays fine solitaire. Hidden set-up is present in the second module, though solitaire players are generally used to working around these things. Special Features - There is a lot of sub-system going on, such as units cowering (reduced firepower when they roll doubles and are not directed by a leader), residual fire left in hexes (affecting other units that subsequently move into the those hexes in the same phase), weapons breaking down (and repairing), leader wounds, ambush before close combat, leader creation, transfer of support weapons and specific rules for some weapons such as using demo charges and flamethrowers and modifiers such as increasing the chance of harm when firing at a flamethrower armed unit. Leaders are also individually named and have individual ratings that are significant during play. The total effect is that there is probably a greater sense involvement with what is going on with the individual squads than is the case with the other games (Conflict of Heroes possibly excepted). Pro - Feels right and intuitive for things like being fearful of crossing open ground or crossing a street and assaulting buildings and in our scenario I got drawn into the action at the individual squad level. The scenario gave one of the more satisfying games here (though it was designed for the system), it is nice to have individual items of equipment such as flamethrowers and demo charges represented on the board, with the tension that goes with things like trying to place a demo charge and then surviving fire to explode it in a subsequent phase or having a leader wounded. Con - Even in this base game one can start to feel the complexity present, not only because of detail added, but due to basic game principles such as managing the different types of Defensive Fire, resulting in longer rules for opportunity fire type situations than found in the other systems mentioned here. This is just a starter module, so the question will be at what point if any will the continued curve of complexity stifle my enthusiasm. As guns and tanks are added, the extra rules that come with that are much more demanding than in the other games here. Bottom Line - I am guessing that I will not go beyond the starter kits and in that regard the ASLSK series is an important product line. I can choose to stay within its limits and still enjoy a campaign module such as ASLSK Elst or I could just stay with the base module and play infantry only games. It is nice to have those choices. The extra detail does add a nice dynamic to the game and is noticeably absent or weaker in the other designs being considered here, though at some point further in the system the collective effect of a lot of detail can get in the way of fun play, resulting in a sort of love / hate relationship with how I feel about that. However as a stand alone infantry only module, it is a well rounded, good valued package and at its price, players should give it a go. It always has been and remains the tactical game that other tactical games are bench-marked against. The best way to find out whether you want to immerse yourself in this system is to get a copy of this module - highly recommended. Playing with Retro (Minden Games). I will take the Retro game next simply because of its close associations with ASL and we can use the same board and counters as used by ASLSK. The outcome of this game - At the games end, the Germans fully controlled building C, contested A and the Russians fully had control of B with strong forces, so another Russian win. In the second game, the Germans took buildings B and C, but the Russian conscripts were surprisingly heroic and fully survived to control building A. The game had played much faster than the ASLSK game, but had less character by contrast. The speed of play allowed me to fit in another ASLSK #1 scenario - 'Welcome Back', in the same evening with the Retro rules. Components - Retro is simply a short rule book that delivers a tactical system with the intention that the user will use the Retro rules with existing maps and counters from other games. It uses terminology that is most closely related to ASL(SK), making those game modules easy to use with the system. I have also used the rules with Panzer Grenadier, basic Squad leader and ATS but they have required modification to differing degrees to get the terminology to fit. Because of this, I think Retro is often thought of simply as a stripped down version of ASL(SK), but this is definitely not the case. Retro will let you play a tactical game, but you will not be playing ASL, even in a lighter form. It has quite a different feel that causes both play and tactics to differ. Here, even with the ASLSK game parts and the same set-up as above to test our game, there are some balance problems. Firepower - On the face of it, the CRT is underpowered compared to ASLSK with regards to actually causing some damage, but when damage is caused, it effects everything in the hex, so big stacks can suffer some painful results. The scenario being looked at today can cause us two problems. Firstly, the weak CRT makes firing across the street into stone buildings largely ineffective and the movement phase happening before the fire phase means that the traditional idea of laying down fire and then moving does not happen - so battles tend to play along the lines of forces moving against the enemy and combat being resolved in a series of Close Combats. So you tend not to play this game like you might ASL (SK) or Band of Brothers, as laying down fire against units in cover will just burn off the turns with ineffective fire and that will feel strange to an ASL style player. Leadership - Much the same as the ASLSK comments. Casualties - Stacking is something to avoid, as a low die roll is likely to bring a KIA result that will affect the entire hex. However, taking high casualties by one side or the other (or both) is a certainty in Close Combat (see below). Broken units only suffer a +2 modifier for desperation morale compared to +4 in ASLSK, so it can be easier to get broken units back into the game - further adding to the feeling of impotency in the low powered CRT. Despite that though, the casualty rate does seem to rack up quickly in this system (probably due to the number of Close Combats) and this can result in a feeling of carelessness as far as handling forces is concerned. Complexity now and future - The Retro system is now in the 4th edition (more of a re-print really) and is presented in a small 36 page A5 booklet. To cover this scenario we will need to learn around seven pages of rules. There are intentional gaps in Retro, requiring the player to also work with the host rule set. So for example it simply refers to 'breaking' in the context of it being a morale test failure and so the player needs to check with the rulebook of the physical game for an understanding of what something like 'breaking' means. At the start of the Rally Phase it says 'Regular rally rules apply'. At the start of the Fire Phase it says 'Usual fire combat calculation is used'. So in other words, you need to have an understanding of the host system when using Retro. If you have played ASL(SK) before coming to Retro, then you will just assume that knowledge and think nothing of it, but if you have never played the host game and hope to just play from Retro, then you will have a learning curve. For example, what is LOS?, Retro doesn't tell you, yet line of sight is critically important to a tactical game and LOS rules are seldom straight forward for the uninitiated. Some mechanics do not translate directly across, so for example while ASL scenarios typically use values of around 3 for ELR, you add 6 to this for the way that Retro uses ELR. Retro itself is essentially uncomplicated but some of the shorthand approaches to the rules and the required referencing to the host rules can ironically bring an additional layer of rule handling. However once you do know the basic principles of the host system, Retro can be a breeze to play by comparison to something as big as say ASL. Opportunity fire - The lack of opportunity fire can take quite a bit of getting used to (the mechanic of Hesitation replaces it - see Special Features below). In the example below, a German Elite unit decides to leave the building hex where the red dice is and move up to the enemy. It moves into M3, which is its first open hex in an enemy line of sight, so it must test for hesitation. It will pass on anything except a 6 - which it does. It can now continue to move into any open hexes without having to test again, which allows it to move to N3, to O3 and then into O4 to go adjacent to the broken Russian unit in O5. Throughout that journey it is not subject to any form of fire, having passed the Hesitation Test. Now all it has to do is survive any defensive fire from the enemy during the Defensive Fire Phase (which is limited to a range of 3 hexes and made on the low powered CRT) and it will then be able to close assault the Russian hex. There is a Russian squad and a MMG in M5, so being able to move so blatantly in front of them without fear will feel counter-intuitive to those who have been used to other typical tactical systems, but that HMG and the close proximity of the squad would have modified the Hesitation test, so in that regard it has in effect performed a suppression / opportunity fire role, as I say, the game requires a change of mindset and a use of different tactics. Support weapons - Todays scenario special rules increases the smoke exponent of the elite squads (which allows smoke to be laid as part of movement in ASL(SK)), but in Retro, a unit creates smoke in lieu of movement rather than as part of movement. Units that move cannot fire, though a unit that fails a smoke attempt does not count as having moved so is still allows to fire. If smoke is made, it will last for 3 turns (rather than just the current movement phase that ASLSK limits smoke use to). First line German units need to roll a '1' to get their smoke, so are unlikely to give up their movement for that chance. The Elite units stand a good chance of laying smoke, but the giving up of movement to do that has to be balanced against the benefit of smoke hanging around for 3 turns. All the other support weapons that come with ASL(SK) are accommodated by Retro. Machine Guns do not feel as effective because some of their influence is captured in the Hesitation rule (see below) and they are limited to firing at just a three hex range in defensive fire - so players will need to re-think how they deploy these to the best advantage. Rout - Rout rules are brief and ruthless. Any unit that breaks in the open and is not adjacent to cover, to rout into, will simply be removed from play - this actually skews (positive design intention) the CRT to become more powerful when firing at troops in the open, while still restrained against units in cover. Close Combat - Both sides simply add up all their combat factors into one lump sum and attack each other in a single attack. Defeat in the hex means ALL attacked units are lost in one go and often, both sides will wipe each other out. The whole thing can feel quite random and often unsatisfactory. Order of Battle - You can play Retro with several tactical systems, so in that regard the potential scenario and available unit types seem to know no bounds. However the Retro terminology works smoothly with ASL, but can be a lot of work to use with other systems, requiring some good knowledge of how the other system works to make that conversion. But even if just used for ASL(SK), the available order of battle is impressive. Terrain - Our scenario today highlights that the Retro CRT feels underpowered when attacking +3 value terrain (stone buildings) and that if a unit passes its Hesitation Test, it can cross open spaces quite easily without interference. This means that Retro players will need to modify their set-up and game play to the 'Retro way', that is not a criticism, it is just highlighting that players will need to adjust how they play and that it changes the nature of city fighting. Because Retro is usable with full ASL, you can use the non ASLSK boards that have walls and hedges with the ASLSK counters. I am also using some deluxe DASL boards with the basic counters. Solitaire - The system plays very well solitaire, especially since opportunity fire and defensive fire are 'managed' uniquely in non-interactive ways. It can be deliciously frustrating when a unit 'hesitates'. Special Features - The two most notable things about Retro are the different sequence of play (for example movement comes before fire) and the Hesitation rule, which is probably my favourite part of the system. Hesitation replaces the effect of opportunity fire occurring during enemy movement (I love the novel idea of this most basic necessity of a tactical game being 'abstracted' out), when a unit moves and first enters an open hex (that phase) within sight and range of an enemy squad or machine gun, the unit must take a test to see if it halts and ends its movement (by returning to the previous hex) or carries on. If it passes the test, it can continue to move and will not test again during that movement phase. It can throw a spanner in the works of the best planned manoeuvre and is good for solitaire play. There are plenty of what appear minor differences with ASL(SK) that have an important impact on play and counter-balance some of the bigger differences in the system. So for example the Desperation Morale rule gives a +2 modifier to the rallying unit rather than the +4 found in ASLSK and leaders do not test for Desperation Morale. It is the sum of all these small type of wrinkles that gives Retro its own unique feel. As a consequence of the Hesitation rule, the Defensive Fire Phase is super simple. If an enemy unit is within 3 hexes of the phasing players unit, then it must fire at that unit .... and that's it, really simple and a big contrast to the lengthy ASLSK rule for defensive fire. It also means that overall, there is substantially less Defensive Fire on the battlefield in this system. It is for the player to decide whether they like that blanket simplified approach or whether they prefer the intricacies that come from the more substantial ASL(SK) rule. Elites perform very well in Retro. In particular they hesitate less than other units when moving and if they are stacked with a leader, they can be almost certain to be proof against hesitation, this undermined the balance of the todays scenario as the elite squads closed to combat very quickly. The scenario provided in the rule book play well and there is a link to a variant scenario provided at the bottom of this post that shows how an interesting and repayable scenario can be put together. Pro - It is a clever system. The strong point about Retro is that you can bring virtually any new rule into the game surprisingly easily .... even rule ideas from other games than the one actually being played. The vehicles do not have turret rules, something that I want to see represented in my games, so I have bolted on an easy 'firing outside the front arc' type modifier and Retro lends itself very well to this sort of tweaking. 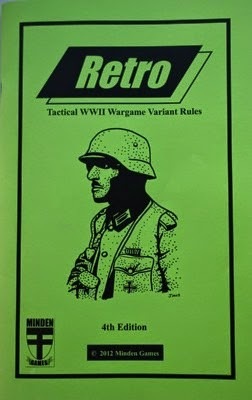 Players who use Retro, enjoy it because it gives fast access to tactical games without a lot of rule reading, this is particularly true when adding guns and armour into the game, Though it would not likely suit players who have got used to detail and like it (leaving complexity aside). Con - Because retro itself is not a complete system, you have to work with the host rules as well to some degree and that lack of streamlining can mean that these days it might just be easier to use one of the more modern 'easy' designs instead. Some smaller scenarios just play too quickly without the associated flavour of something like ASL or ATS or Band of Heroes and not all ASL scenarios will translate well. It does better in bigger games and in the 'Do Your Own' battles scenarios that are included in the rulebook. Bottom Line - It does give the player easy access to a wide range of product and makes big games easier to get onto the table, though players need to adopt new tactics to get into the 'Retro way', in which the relationship between fire and manoeuvre have a different twist. If you have a load of ASL product that you are not using, then this small rule book may get you moving squads around again. Retro was produced before the ASL starter kits were in production or before the more recent designs mentioned here were in being. At that time, this made Retro a most valuable and welcomed tool for those wanting easier rules. But today there is a solid ASL Starter Kit line-up and several new low complexity, good looking tactical games sharing window space with ASL(SK) and in that world, Retro faces a lot of competition, especially as conversion to use with other systems can take a bit of work. However, at the cost of the small booklet, I think many players would be interested in picking up a copy and just checking the fascinating mechanics out. What the author achieved those many years ago was impressive and thought provoking. The rules may even inspire you to modify your own games to better suit your preferences. Playing with Band of Brothers (from Worthington Publishing). To try and get something to resemble the War of the Rats scenario, I have selected two boards that give a cityscape and selected the right number of units, though we cannot replicate the flamethrower or demolition charges. Note, the system uses an interactive system and there is a link at the foot of this page that relates to a replay using armour, which gives a good overview of the sequence of play structure. This particular system gets superb designer support at BGG and CSW. Below are the two maps showing the starting set-up. Russian conscripts are on the left and 1st line squads on the right. The outcome of this game - The game played quite quickly. Turns are interactive rather than each side having their own player turn. The first half of the game was spent with the Germans putting down fire, which did not really cause an obvious breach anywhere. With the clock ticking, they decided they had to brave it and advance at specific points that held the most promise. The German left wing was probably too underpowered. They advanced out into the street and got really hurt and that flank never really got back into the game. By the end of the game, the Germans had managed to take their right (our left) flank building from the conscripts, but the two objective buildings on the right were firmly in Soviet hands. So another win to the Russians. Components - The game uses over-size counters (nice) and the map boards (unfolded) are the same size as the box base and are geomorphic. Two boards widthways give a hex field 17 wide by 8 deep, measuring 22" wide by 8 1/2" deep. The smaller map sections can be a bit of a nuisance as they can slip around and in the bigger scenarios that use more maps, that becomes more noticeable. The answer is to use plexi-glass to fix them in place. The map artwork has been described as bit 'cartoony' by some, but I quite like it. Also the effect of using small geomorphic maps means that the road network has some gamers feeling it is too prominent once you get into games using 4 or more maps, but the large hexes (and counters) are most welcome. Firepower - The system uses a D10 for everything, which actually makes assessing the chances of successful fire and other things quite easy as one can think of the chance of success in terms of percentages. Units are rolling against their firepower and some of the modifications can be quite impactive. A unit can get a +4 against units moving in the open (opportunity fire) and +3 against adjacent units that are stationary, so a player has to work hard to suppress the enemy before daring to venture out into the open to assault. This feels intuitive and there are plenty of gamers (including those with service) that comment that this part of the system gives a most realistic feel. Firepower against units in buildings seems to be similar in character as ASLSK in terms of effectiveness, though note (only as a point of interest) in this system the sequence of play has one single turn rather than two player turns, so units are firing once per turn rather than twice as described in the ASL(SK) report above. Leadership - There are three things going on that reflect leadership. (1) Each side will get some command points to use each turn. They can do things like re-roll a melee or morale die or allow a player moving second to trump the enemy and move first. I'm not keen on them as they feel a bit generic and tend to work to 'average out' some aspects of the game and certainly in Ghost Panzer, can help the German who already has many advantages (see the AAR below to see how they trump the enemy tanks that have successfully manoeuvred against them) and I feel it causes some loss of dynamism in the game. (2) The Operations Range - Each side gets a range (two numbers). In their turn the player must activate at least a number of units equal to the first number of that range and may also activate more units to make up to the value of the second number, after which play switches to the other player who activates within their operational range and then play switches back. In our game above, we chose an Operations Range of 2 to 5 for the Germans and 3 to 4 for the Russians. So the Germans would have to activate two units, but could in fact activate up to five units before play passes back to the other player. Compared to the Russian rating, it makes the Germans more flexible and responsive. (3) Proficiency reflects the capability of a unit when required to do something slightly demanding. So for example, all units can fire normally without issue, but to perform opportunity fire - which is harder (because you are responding), the unit has a different firepower to reflect their training and leadership. In the east front game, our 1942 Soviet units have a normal firepower of 4, but if they opportunity fire, they use their proficiency fire value of 1, that is a big difference, especially as panzer grenadiers have respective values of 6 and 5, which really allows them to prosecute a firefight. Units must generally test (roll) when they want to do something. 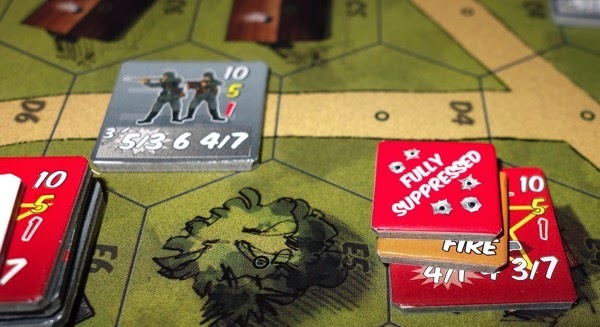 Fresh units with a morale of 10 will always pass, so there is no need to actually roll the die, but as units take their first suppression (yellow marker) or full suppression (red marker), they become much harder to use as their morale levels drop. The system does reward the tactic of using fire to suppress the enemy to enable manoeuvre and assault. The dual effects of proficiency and suppression are my favourite parts of the game. I also like the way that the heavy machine guns do feel like they are key units, fulfilling their role when causing suppression. These are really strong positives in the game. Later in the game when the player uses tanks and guns, proficiency is used in a different way to show the difference in factors other than raw gun / armour stats. A good example is that a vehicle with a turret might have a proficiency rating of 8 and one without a turret might be valued at 7. That would make the turreted vehicle 10% more effective in engaging the enemy - a really nice touch. By the same token, you could have a Russian tank with a proficiency value of 5 to reflect the cramped turret, dual responsibilities of the driver and poor training. The tank of value 8 would substantially outclass the tank valued at 5, even though they both might have similar armour or guns - how clever is that! Casualties - In this system, squads flip to their reduced side when taking casualties and they take suppression results (as opposed to breaking) by adding a yellow or red marker. The administration for suffering reduction works, but feels a bit clunky to me. Basically each infantry unit has their own casualty rating on their counter and if the fire dice plus the targets casualty number are equal to or less than the adjusted firepower of the firer, the unit takes a casualty - yep, you are probably reading that sentence again - for this player, it just does not feel as smooth as everything else. The 1941 Soviets have lower proficiency numbers, lower firepower and higher casualty values and all those things combined do not see them fare well against the stronger Panzer Grenadiers. Complexity now and future - There were rule changes when Ghost Panzer was introduced to streamline the system and reduce the number of dice rolls. That was for the good and today the system is stable. Playing todays scenario requires us to know 8 pages of rules. To move on to fully include armour and artillery just requires an extra 5 pages and that will appeal to many gamers. I can't imagine the promised expansions adding too much to that. Opportunity fire - Below, the German squad in the centre has decided to move out from the woods, cross the road and intends on getting into the houses between the Russian wings. The three numbers on the right of the counter show different levels of morale - White 10 for good order, yellow 5 for suppression and red 1 for full suppression. So a good order unit will have a morale of 10 and when yellow suppressed a morale of 5 and when red suppressed a morale of 1. Two Russian squads opportunity fire (and are marked 'used'). The first misses but the second hits which causes yellow suppression. The moving squad gets a yellow marker and must now take a morale test to carry on moving (needs to roll equal to or less than the yellow value of 5). It fails and so is marked 'used' and ends its movement out in the open. I think this effect is a lovely part of the system. Below the Russian squad has taken two hits, so has gone yellow suppression with the first hit and then red (full) suppression with the second hit. It will now only be able to activate if rolling equal to or less than its red number (1) on the right side of the counter. The German squad thinks its safe to move out into the open as the Russian squad is unlikely to pass its morale test (10% chance) to opportunity fire as it needs a '1' on a D10. But ... it does in fact roll a 1, so it can fire. It's strength will be 1 (for the proficiency firepower, used in opportunity fire and which is lower than its normal 4 firepower) plus 1 for being under an Op. Fire marker (the orange counter), plus 4 for firing on a moving enemy in the open, for a final strength of 6. It must roll equal to or less than this on a D10 to hit, which it does. The German squad takes a yellow suppression maker and must now test against its yellow morale figure to see if it can continue moving - it fails and ends its movement. So fully suppressed enemy units can still pull some surprises out of the hat - ouch! Support weapons - We couldn't get light machine guns or flamethrowers into our game as they are not separately represented in the system. Other support weapons we do see are small mortars and heavy machine guns and they come with their own integral weapon teams. Hand held anti tank weapons are shown on the unit counters. I like the HMG's because they are quite fearsome and are particularly important to the Russians for some extra heavy and much needed firepower. Rout - The system has a rout phase, but it is interestingly loosely linked with the melee phase that follows it. Units test for rout simply by being in proximity of an enemy and the player who moves first in the scenario tests first - so if you are in melee with an enemy and take a rout check and fail, you must move out, but by moving out, you now end up adjacent to an enemy not in melee (it no longer is because you moved out) and so you get eliminated for being adjacent. It works well, though is pretty ruthless. There is also this thing that if you fail a check by as much as your first casualty figure on the counter, you are reduced and failing by as much as the second figure you are eliminated. That's no real problem, but I just have a mental block about those casualty figures. Close Combat - For units that survive the rout phase, close combat follows. I love the simplicity of this. Each squad present just rolls 2D10 and for each die that scores equal or less than the units firepower, one enemy unit present must reduce. It produces effective results but does not always clear a hex - good. Order of Battle - At the time of writing there are two modules. Screaming Eagles (SE) covers U.S. Paratroopers in 1944/45 and Ghost Panzer (GP) the 11th Panzer Division in Russia 1941/43. There is a U.S. infantry division being covered in a few months and after that a Commonwealth division. So the system is young but growing. For our scenario here, the Russian Order of battle is not a problem because GP has 1st and 2nd line squads and a heavy machine gun. 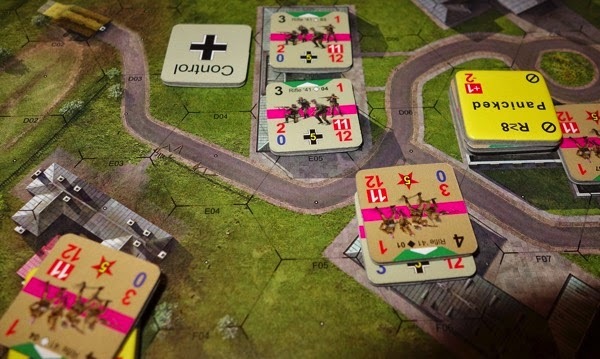 The German side do not have elites as such, so we will need to use their Panzer Grenadier counters from GP, mixed with some of the 1st line units in SE (I have upgraded the SE counters to GP standards by adding sticky labels with new fire values on them - available as a download from BGG, though the next game in the series is said to have official replacement counters). Our only translation problem comes in not being able to visibly represent flamethrowers and demolition charges. To help balance the loss of this assault capability, the German Command points were set to 3. Also we don't have a rule to allow infantry to create smoke, which is quite useful in the ASLSK scenario, though we do however gain easy concealment rules and in this scenario, all units will start concealed (which is a defender advantage here) making them harder to hit. We will make a special rule that all buildings on the map are of stone construction. Terrain - The terrain boards give a variety of terrain that includes hills, hedgerow, buildings, woods and canal. Orchards and Dike Roads are not graphically shown on the map, but rather exist by special scenario rule - a pity, I like orchard type terrain. Not everyone will like the terrain artistic style, I generally like it, but think the hills look poor. There is quite a bit of open terrain and on big games this gives tanks and guns clear views out over respectable distances, you will be running some tank / gun battles at 20 plus hex range. The map boards are individually rather small and tend to slide around once you get a few together (unless held down by plexi-glass) making lines of sight between hex centres on different boards open to 'discussion'! Solitaire - Solitaire play is fine except for those scenarios that use Decoy (dummies) counters. There are some solitaire rules in Ghost Panzer, but they assume that the player will favour one side and so 'manages' some fog of war for the other side. I find the best way to deal with them for solitaire play is simply not to use them, but just replace them with a unit, so for example for every three decoys, give the player an infantry squad instead or entrenchments or whatever feels right for the scenario. As per my comment on ASLSK - solitaire players are generally used to dealing with such things. Special Features - It has already been mentioned above, but the clever thing being used here is the proficiency rule and the way suppression / morale works. Yes, very clever and gives a lot of realism for little rules overhead. Pro - A major strength of the rules is that tanks and artillery can be added in for just a few more pages of rules and give good credible results. One thing for sure, you can put 20 tanks on the boards and get through a game easily without having the rulebook in your hands. The simple proficiency idea superbly and easily simulates the crew quality, lack of radios, cramped turrets, turrets themselves and training side of thing. Off board artillery is simply a joy to use compared to some more complicated systems. Con - The Pro's are quite big and the Cons relatively small. I am not a fan of the smaller maps and I don't take to the system that uses casualty ratings to determine casualties. The Command points feel a bit generic. What surprises me most is that I think some of the systems here are the best at simulating the battlefield and yet I am at times left feeling that it plays mechanically rather than atmospherically, I can find myself racing through the battle, just rolling dice and in that regard it trails ASLSK. It may just be the scenario mix as the bigger scenarios with a greater mix of unit types and where there is room to manoeuvre, seem to have a better feel than the smaller affairs or maybe it could just do with an injection of ASL style smoke, flamethrower and demolition charge type rules to add some character. The first module put crack paratroopers against 2nd and 1st line troops and Ghost Panzer has powerful Panzer Grenadiers against low quality 1941/42 style troops and while these unit differences are strong and realistic, they may not make for the most exciting scenarios. The scenarios can also suffer from having units spread right across their map (especially in smaller games) giving a somewhat wall - to - wall appearance and the map edge is noticeably present when that happens. There is enough brilliant stuff here for this to be my favourite game - but it isn't because of these points mentioned (note - I don't have a favourite). Bottom line - The cleverest of the bunch here in my opinion, it does a lot with just a short rule book and portrays fire / suppress and advance tactics well. It should be popular with anyone wanting a decent system that feels realistic rather than gamey, but without too much rule reading. It needs to grow and get some better scenarios but I think that will come. 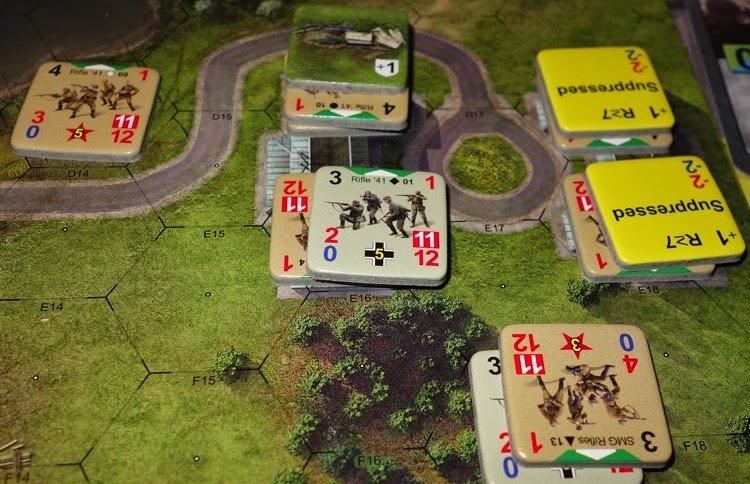 The game is different enough and easy enough to quickly get into to make it worthwhile recommending that the tactical gamer picks up a copy - probably Ghost Panzer (base game) is the better of the two modules to try. It currently has the upgraded rules and counters and in my view has the better scenarios. The next expansion will be themed around a U.S. infantry division. This system does look like it is going to receive quite a bit of support in terms of new releases and without any growing complexity along the way. Playing with Conflict of Heroes (Academy Games). For our Stalingrad 1942 scenario, we can use the 'Awakening the Bear' base game and game board 5. Most of the items present in the ASLSK scenario can be selected. 3 pioneers will replace the 4 elite squads as they are more powerful than the ASLSK pieces - though so are the 3 LMG's, but we will keep all three. The Russians do not have separate LMG units in the game, so to compensate in part, The Germans will set up first. I worked out a rough formula for the ASLSK leaders and converted this over to Command Action Points (CAPs), with the Russians getting a CAP boost when their reinforcements arrive. The scenario conversion is available as a downloadable PDF, to save some space here LINK Scenario Conversion. Just look at that lovely terrain. The outcome of this game - The game was set-up (above) to resemble the starting positions in the War of the Rats scenario. The game played for 6 rounds (like turns in ASL). Action Points (AP's) were determined each activation using the optional random AP rule. At the start of play both sides were dealt two cards. Using a point system created by a BoardGameGeek user, I reckon the Russian force is worth about 140 points, rising to almost 200 once their reinforcements arrive, while the Germans have around 250 points from the start. Up on the left, the Germans with their very effective pioneers (who can continually use flamethrowers without them running out and can always make smoke by paying 2 AP's) take buildings A and B (building A was embarrassingly left abandoned by the Russians as an oversight when moving to guard their flank). The conscripts at building C (top right) held on and two of the SMG reinforcements came on there and hit the Germans Hard. The third reinforcement came on the left to pin those Germans around buildings A and B. In the second game, the Germans won by taking the final building (C) on the very last dice roll - games are always exciting when that happens. Components - The boards are high quality mounted and hinged, each measuring 19" x 15" and having a hex field 17 x 11. The first thing that strikes you about the game is the sheer quality of the components. The counters are thick one inch affairs and all the graphics are nice and sharp. The whole game gives an impression of being a labour of love. It is the nicest looking game by some margin of all those shown here. Firepower - Calculating firepower is really easy. Take the attack value on the counter and add 2xD6 and then up to 2 Command Points can be added if the player wishes .... or even has any! This is the attacker value. The defender takes the defence strength on the counter and adds any terrain benefit and that is the defence value. If the attack value is 4 or more higher than the defence value, the target is removed from play, if it is the same or up to 3 higher then instead the target unit draws a casualty chit. Not only is this a simple system that doesn't need charts, but exactly the same principle is used when we move onto armour, making progression into the rules easy. A lot of the time, you can just feel like you are looking to roll say 10, 11 or 12 to get a hit and so the players will look for ways of enhancing firepower and this will include getting next to or in the same hex as the enemy, using Command Action Points or forming fire groups. Leadership - The sequence of play is highly interactive. Both sides have a command track. A track is given 7 points (or a random number via the optional rules) when a unit is activated. The unit might then say spend 1 of those points to move a hex, then because the unit has done something, play would flip back to the other player, who would have one of their units do something, after which play would revert back to the first player, who would take another action with their activated unit, spending the appropriate number of Action Points to do so (say 3 points to fire - leaving 3 points out of the original 7 still available on their track) and so on. Play flows like this in a sort of sequence of alternating actions. Once a unit has spent its points it is flipped to its spent side - though there are some ways to still fire a spent unit, so they don't automatically become victims of an enemy looking at trying to pick off spent units. To add further intrigue, more than 1 unit can act at the same time and share that same action point track as group activations, or units can 'opportunity' act, meaning they interrupt their own active unit, but can only take one action and are then fully spent (that is an expensive way to use a unit but sometimes is essential and it's nice that the 2nd edition rules have so much activation flexibility). There is a second track that holds what might be thought of as a pot of reserve points (called Command Action Points - CAP), perhaps representing the influence of more effective or prominent leaders. These points can be used to supplement the actions of units partly or in full. Also a card can be played as an action - though note this is not a card driven game. The nature of this style of play means that at any one time, considerable focus is being given to just a few units and that draws the player in to caring as to what is happening at the unit level - and of course there is no 'down time'. The cards in the game are sensibly constructed and bring some nice effects and avoid feeling generic. Mostly players will only draw 6 or 7 cards in an entire game, so they have a gentle effect on play. Casualties - One of my favourite parts of the system is that when a unit takes a 'hit', a casualty chit is drawn and this determines the nature of the harm caused. Perhaps the unit is pinned, unnerved, suppressed, cowering, berserk, stunned, panicked or KIA'd. Each of those states has a different effect of the unit (highlighted on the counter for ease of implementation). So a cowering unit is harder to hit (their heads are down) and it costs them more points to fire or move. Whereas panicked units are harder to hit, but also can't fire at all. A KIA chit just immediately removes the unit from play. The harmed unit has a chance to rally a casualty marker away, but if they gain a second hit while still holding a casualty marker, then the unit is simply removed from play. So being hit can have varying effects, but failing to rally can invite deadly attention. Note - Vehicles use the same system, but have a different chit set to represent damage etc. Not all vehicle casualty markers can be rallied away - some of that damage is permanent and a liability. Complexity now and future - The rules have changed. 2nd edition rules are substantially more inter-active. To help ease the player into the system, the rules are divided into sections in which you learn a few pages of rules and then play a couple of scenarios. The player can then learn the next part of the rulebook. This is programmed learning, similar to that done in the basic Squad Leader set of 1977. Having regard for the design ethos, I can't imagine complexity increasing with future releases. Opportunity fire - This is the most interactive game of those shown here as the play passes back and forth between players very quickly, typically after moving each hex or making each fire and therefore any need for opportunity fire rules is interestingly negated as by the nature of the system, after moving, play passes to the other player anyway. 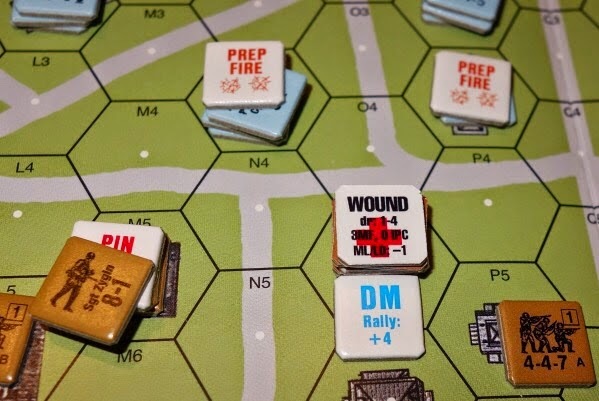 The limitation of course is that after one fire, play will revert back to the moving player, whereas most other systems might allow multiple units to fire on the unit that just entered a hex. It doesn't feel an issue in play though and the effect of reducing a potential firestorm of opportunity fire might actually be a good thing. Support weapons - As with ASLSK, the Germans get the separate light machine gun counter and the Russians don't! Here the LMG's feel more effective than in the other games, especially as the German MG34 only pays 2 AP's to fire, so can put down a lot of fire. The tripod mounted MG is even deadlier with a fire value 5 and likewise only needs 2 AP's to activate. They could typically fire 3 times per turn on average if they were not moving and more if using randomly generated AP's. Small mortars and anti-tank rifles also have their own counters. In Storms of Steel (the Kursk game), demolition charges and flamethrowers are represented by cards - though in our base game, the pioneers are flame armed. Rout - The concept of routing is not present in the system and in truth is not missed at all. I suppose it is in part replaced by the fact that if a unit collects a second casualty marker it is removed from play, so encouraging players to better manage units with a single casualty chit, either by trying to rally them (costs a huge 5 AP's) or at least getting them out of danger. Either way an enforced ejection from a location by a rout type mechanic does not happen. Close Combat - The big incentive to get into Close Combat is the +4 modifier to strength that each side gets. The 'impulse' type play means the attacker will spend an AP to get into the enemy hex and then play will flip straight back to the other player - who more often than not will then get the first shot in against the attackers. Because of this, attackers will try and seek out units that have previously activated and are marked as 'spent'. Terrain benefits still count in Close Combat for both sides, so in some respects that +4 advantage can be softened and so units in CC are likely to pick up a casualty chit rather than being immediately seen off and CC can be carried over into the next round (like a turn), which is in keeping with the other main systems here. Order of Battle - Presently the available Order of Battle is a bit limited, especially with the Kursk module being out of print, but we have 41-42 Russian / German and 1939 Polish in print and the east front 1943 out of print. The company are slow in growing the system, with several new modules having been promised for quite some time, though the recent re-print of Awakening the Bear is lovely. Apparently Guadalcanal will be the next module. Terrain - We get our walls and fences, which I like in tactical games system and a fair bit of variety amongst the boards from the 3 games currently available, plus the expansion marsh board. Aesthetically the boards are beautiful, though hexes are marked lightly and there is terrain spill (artistically done) over the hex, so there is not always the immediate preciseness of terrain recognition that you get with an ASL board. The hex is entirely classed by whatever terrain sits on the centre dot. So if a small building is on the dot, the entire hex is considered building filled and will block line of sight (rather than just the outline of the building being a block). It all works fine and line of sight rules are easily managed. Solitaire - For solitaire play the gamer does have to manage two sets of tracks that are continually adjusted as units spend Command Points and there are some cards involved (this game is not card driven), but there is nothing really that obstructs solitaire play, though artillery is plotted in one round (read turn) before its execution in the following round, so will not be delivering any surprises. There are solitaire rule suggestions that help with any scenarios that have hidden units and there is about to be a dedicated solitaire module released (March 2015 apparently) with strong input from John Butterworth, so expect some good stuff there. The fact that play flips back and forth so quickly produces very nice and important effects, which actually helps solitaire play, but the mechanic of continually moving your hand between the game counter and the AP tracks does also bring a sense of disruption to the flow of play - but it is what it is. Special Features - The game is highly inter-active with play flipping back and forth between players each time a unit does something. Units can perform several actions per round (read turn) depending how may points they have to spend and how much those actions cost, so a German LMG can fire 4 strength points for a cost of 2 Actions, while the Russian 1941 squad will fire just 3 strength points and it will cost 4 AP's from their allowance. There is a lot of flexibility in how AP's are used. Say a German LMG in a building gets lucky and rolls 10 Action Points. They spend 1 AP and move 1 hex to get out into the street. It then becomes the other players turn, then the turn flips back again and the German can spend 2 AP's to fire right down the street, play flips to the other player who fires on the LMG and causes a casualty chit to be drawn. The chit says 'pinned' so the LMG cannot now move or pivot. The LMG pays 5 AP's (leaving just 2 AP's on the track) and attempts to rally the casualty chit away - they fail! So all that action surrounding the one counter gives a great immediate narrative and draws the player in to focusing on that one squad, creating a deeper relationship between the player and what is happening on the board at the squad level. The basic rule awards every activating unit 7 AP's, but the optional rule (highly recommended) has the activating unit rolling 3xD6 and then adding the lowest and the highest two scores to determine AP's for that unit. It adds a nice dimension to the game. Pro - Graphically this stands out from the other games here. The rules are pretty easy to assimilate and I got drawn in to the action at the individual squad level, you do feel like you care about what happens to each squad. It has good atmosphere but it needs more modules to make this compete with other systems. Con -The Action Point track is important and at the heart of the game, but sometimes managing it (in solo games) feels like it gets in the way of just playing on the board. 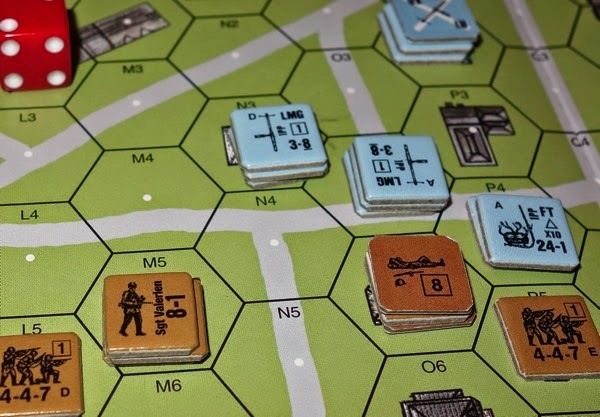 Some of the bigger scenarios with 3 or 4 boards may take up more space than followers of this 'war-games in small spaces' blog might be able to manage. Bottom line - This is a smart looking and very playable tactical game. Before I bought it, I always had the impression that it is a simple game sitting just above Memoir '44. This is not true. It has sophisticated play and the rules need to be read a few time to fully appreciate exactly the scope of activation. I would say that the band of Brothers rules are possibly easier than these on a first reading, but that both games in the end share similar complexity, and like Band of Brothers, it brings vehicles and guns painlessly into the system. Play is dynamic with no down-time. Managing Action Points will not be everyones cup of tea. The game has been updated with new rules, so if you are researching, avoid reviews, ratings and player experiences that relate to the first edition. If you want to try it, get 2nd edition Awakening the Bear. If you buy the first edition, then you will likely also want the 'Price of Honour' expansion games that updates the 1st edition rules and counters. Playing with Tigers at Minsk. These are my own (free) rules and there are other posts in this blog that cover them. Essentially they were designed to use miniature figures on hex terrain (4" tiles) on a matrix 8 wide by 6 deep, so that we could get a miniatures game on a pinboard sized area. So the rules can be used to play our scenario without too much conversion (the scale is out). I will use the city boards that I made from hex blanks and make a rough conversion of the ASLSK map with appropriate compression of scales. Buildings will either be large (2 hex objectives) or small (1 hex) and there is a road. I have included a link to an AAR on one of the scenarios presented in the free rulebook at the foot of this post and there is also a link to get to the rules themselves. To replicate the War of the Rats scenario we have 3 building objectives, the Germans have 1 flamethrower asset and 1 demo charge asset. The game starts at 1100 hours and ends at 1200 hours. The number of squads and MMG present will match the ASLSK scenario. To represent the Russian conscripts in the Order of Battle, the Russian Command span will be 1 hex and just one adjacent hex (not the usual two). 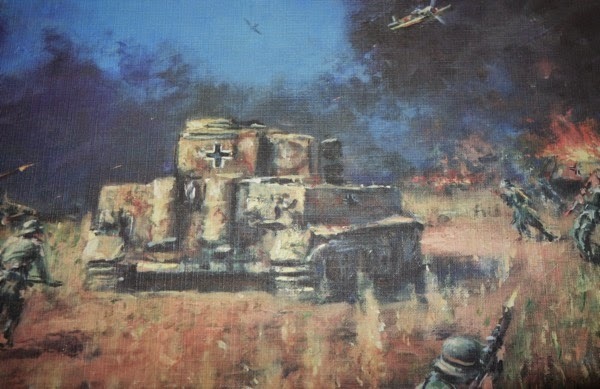 To represent the German Elite units, we will use four panzer Grenadier units that get an extra fire dice (3 instead of 2) and we will put their smoke capability up by one pip on the die (but in this system, the first time that a unit fails to roll smoke - the capability is lost for that side for the rest of the game). The outcome of this game - The large number of squads in this small area meant that fire was pretty intense and so heavy casualties occurred on turns 1 and 2, quickly driving the Russian Morale down. They were lucky that their reinforcements arrived on turn 2, which gave them a small morale boost. At 1123 hours (turn 3), Russian morale collapsed, most units failed their test and fell back one hex. For the next 30 minutes, they managed to hold on, repeatedly moving forward off their base line, only to be driven back each time they lost a base (through failed morale checks). At turn 7 it was 1154 hours and the game was almost certain to end, but the clock dice (2 x D6) score was just 3, moving the time to 1157 and allowing another turn of play - but it was not enough for the Germans to oust the deadly SMG units in this close environment. At the end of play, they had captured the left building (A), but on the right both objective buildings (B and C) were still in Russian hands - so another Russian victory. Components - The Ruleset is a 44 page free download with less than 20 pages of well spaced, large text rules. The rest of the pages are charts, scenarios, design notes and examples of play. I like the aesthetic of the figures, though I am making myself a boardgame version for reasons of doing some quick and compact mid-week (or vacation) sessions and getting the total playing area smaller while increasing grid size. My table hex size is 4" from flat side to flat side and I use 10mm figures. Firepower - My ground scale is 100 - 125m per hex, which is greater than the other games here and so SMG units can only fire 1 hex, but they fire with 4D6, making them dangerous. That works out fine for my own scenarios, but todays scenario needs units firing at buildings on the other side of the road and SMG's can't reach that far. Infantry are typically rolling 2 or 3 dice and needing 5's and 6' against targets in the open and 6 against targets in cover to hit. A hit causes a pin and a second pin removes the unit. Leadership - Each turn the player selects 1 hex plus 2 hexes adjacent to it, automatically putting all units in them into command. Then every other friendly occupied hex must independently test for command. To be out of command means that those units cannot take any actions that turn (except opportunity fire). This is meant to represent the local commanders being focussed on the part of the board in immediate need rather than having the 'all seeing eye' that can give a player too much control. During play, going 'Out of Command' happens fairly regularly and puts a good brake on play, stops things being over co-ordinated and adds some nice chaos / frustration. Casualties - Two hits results in the removal of a base. Morale drops with each base lost. When morale reaches zero (typically after 50% losses), that side must have every unit test for retreat. Failing units fall back one hex. This can take the momentum out of an attack or prise defenders out of key positions. This mechanic makes each loss important and felt by the player and the test is repeated with every further loss once the zero level has been passed. In some games, both sides will hit this point. Complexity now and future - The rules generally avoid 'exceptions' and for the most part, the game can be run off two quick reference sheets (back printed). The rules will not increase in complexity, everything that is needed is in the base game, future additions will simply increase orders of battle to cover more nationalities and time frames. Opportunity fire - Units do not have to be in command to opportunity fire, but once fired they are marked as OP. Fired and cannot fire again until they remove that counter by being in command in a subsequent tun and using their action to remove the marker. HMG's and Anti-Tank guns are assumed to be specialist opportunity fire units, so whenever they fire, they always roll another D6 of another colour and on a 1, 2 or 3 the firer is NOT marked with an Opportunity Fire marker and is free to fire again as appropriate. When a unit starts their turn with both a pin marker and an Op. Fire marker, they will only be able to remove one of them (units get 1 action) and that can cause some tough choices. Support weapons - Flamethrowers and demo charges form part of a sides admin assets, which can be called upon once the rifle sections are actually in close combat, they are not actually carried by any one particular base. Each infantry stand represents an entire section, including the section LMG. Hand held anti-tank weapons, if present, are given an availability number (for example 4) in the scenario, they are not carried by the squad. When the squad wants to call on such a weapon they roll a D6 and try to roll equal to or less than their availability number to get the weapon. If the roll is higher, not only do they fail in their bid, but the availability drops down by 1 value - so in the above example the new availability value would be 3. The potential availability of anti-tank weapons can quickly deteriorate to zero. Rout - The system does not use a specific rout phase, but as explained above, the moment a players morale drops to zero (or lower), play is suspended while retreats are assessed. On a board that might only be 6 hexes deep, the effects can be very influential on play and units sitting on the board edge run the risk of just being removed from play. Close Combat - Both sides will collect a number of D6 for their situation and roll as though the enemy is not in cover (i.e. 5's and 6's are hits), though defender cover is factored in by them having an extra fire dice. In our game above, an SMG defender in a building attacked by a Panzer Grenadier unit (representing an elite squad) would be calculated as PG = 3D6 and no bonus, SMG = 4D6 and 1 bonus D6 for defending a building. Having a flamethrower asset to deploy would add in a further 3D6. A standard Russian or German section would only get 2D6 each and a pinned unit just 1D6. One round is fought and the side with the higher loss is pushed out of the hex (or removed from play if they can't absorb all the hits). Order of Battle - At the moment, the troop lists that come with the rules cover the East Front in 1943, but they will be added to over time - this is all linked into my schedule for painting up models etc. Terrain - In some ways, terrain variety on the board just adds to the atmosphere and story telling, but basically cover is cover, so something is either in the open or it is in cover. A building offers the same protection as a woods etc. The only exception is that if anything is classed as fortified, then it is enhanced and will have a stronger effect on fire and morale checks and rallying from pin results. Solitaire - It plays well solitaire and most of the designing was done in a solitaire environment, just play both sides fairly. The random game clock and random events brings some outside influence / chaos into the games that helps solitaire play. Special Features - Units are generally moving just 1 hex here, representing cautious movement. There are game turns, but a game clock also runs. At the end of each turn two dice are rolled and their sum represents that number of minutes added to the game clock. The clock is used to measure when the game will end and to bring in reinforcements and random events. Tank combat takes account of gun / armour differences with this rolled into other factors to give what amounts to a 'To Hit' result that can cause damage. If hit, the attacker rolls on a simple penetration table, which includes a 'stun' result, something that the vehicle may recover from during play (could be just temporary concussion caused or minor damage etc). Pro - The game has some nice rule quirks, though the 8 x 6 grid can be limiting. It's main advantage is that figure gamers can have a smaller, cheaper and easier to store game than might otherwise be typical for a figures game (this blog is all about gaming in small areas) - this game was played on a large sized pinboard. Reducing the Russian command capability in this scenario did help reflect the nature of the conscript troops that formed 50% of the Order of Battle, but not as much as would be the case if my system had better differentiation between troop types. The anti-armour system has gone through several tweaks to get the right feel, I am quite pleased with them now. Con -There are some differences between infantry unit types but not enough compared to the other systems and so the infantry can feel a bit generic at times and the limited size of the battlefield can lead to a problem of 'wall to wall' deployment. In this scenario, we had a lot of squads and two or more squads in a hex make it target rich (attracts more fire dice) and early casualties were very high due to the high volumes of fire. Bottom line - The rules are a bit niche from the point of view that they compliment small battlefields, but they do get miniatures onto the kitchen table. They are free, so the reader can browse them just from an interest point of view without making any commitment and might even see an idea there that they want to bring into any of their own games. I suppose they could even be used with some tweaks with any of your other tactical games in the same way that Retro attempts. I obviously like the system since I am the author, I suppose the weakness in our replay being that it does not give as good account of the range of differences between conscript and elite units as the other systems. Once in command, a 1941 Russian squad will have the capability pretty much of a 1944 squad, so they are somewhat generic. The design aim was to get something that gave a good narrative, but without complexity. Others will have to be the judge as to what degree that was achieved. At the level (basic) of play we have chosen, all five systems can be thought of as being relatively simple considering the potential complexities of tactical gaming. It will be the next step up to using tanks and artillery and the resulting simulation v complexity issues that will most likely influence players on which system they want as their 'go to' game. Forcing myself to make comparative assessments of the five games and playing them side by side in a short period, interestingly highlighted two things. Firstly, none of the games use a firm structure of platoons or company level command (but Conflict of Heroes hints at it in their scenario set-up instructions), though all have the significance of command and control at the very heart of their system and show it in quite different but still very abstract ways. It seems that almost 40 years on, basic Squad Leader (Avalon Hill) still influences squad level design and that John Hill's (SL designer) ethos of 'design for effect' is still alive and well. Secondly, this thing about 'caring' about what was happening at the squad level, struck me. I suppose it highlighted those games in which for a short period a unit felt a little more under the spotlight and personal. In CoH, it may simply be because you are often working with the same unit over multiple actions and with ASL(SK) the higher level of complexity / outcomes / effects of casualties / leaders and unit quality shifts, seemingly give a deeper connection with the playing pieces. Either way, where I have not felt that, the systems seem to have a blander handling of the individual squad or a more generic feel. I am not sure that I have even explained that well, but 'care' for me seems to equate with greater involvement or engagement with the game right down at the squad level. Of all the games here, there are none I dislike and would happily play any and I would happily recommend each to the reader. I do though prefer gaming at the lower level of complexity, so I am unlikely these days to step up to the big systems and I particularly want armour and artillery to be simply modelled - it is just horses for courses I suppose. Components - Conflict of Heroes is way out in front, but I also like ASL boards for functionality. Firepower - The D10 system (Band of Brothers) allows the player to readily relate to percentages to better appreciate the chances of outcomes. On 2D6 systems it is harder to intuitively feel the differences between rolling 7, 8 and 9 in terms of chance, due to the bell curve effect. The ASL(SK) fire table does however feel like an old friend. Leadership - I am increasingly wanting to see leadership effects across the entire game rather than just concentrated in a few leaders. Though I am not sure that any of the games here actually model leadership alone in a way that makes one system more notable than another (Band of Brothers proficiency system does stand out as a mechanic that differentiates between unit capability, though it is probably covering more than just leadership). Casualties - The casualty chits in Conflict of Heroes are a novel and easily managed casualty system. The Band of Brothers casualty rule just does not gel with me. ASL(SK) brings more interesting breakdowns in the deterioration of a squad. Complexity now and in the future - All the games except ASL(SK) present themselves in full in the first module and all are likely to remain at the same complexity level. ASL(SK) has an ongoing learning curve and also a game richness that goes with that. One just needs to find their own point on that curve that is comfortable. The ASL(SK) starter module #1 is however very accessible. Opportunity Fire - The residual fire left in hexes is very good and only seen in ASL(SK), and I like the way Band of Brothers allows units to go into overwatch as an alternative to making them move or fire when the operational range has to be fulfilled. The turn sequence in Conflict of Heroes negating the need for opportunity fire rule is also of interest, with the Retro Hesitation rule being the most intriguing. However, it is the need to be able to stop an enemy by firing but not making yourself fully spent and therefore vulnerable in the process that seems to be essentially important to opportunity fire. In that regard ASLSK with random rates of fire for MG's and detailed defensive fire rules does the best job. Only ASLSK and Band of Brothers have what we can generally term as unlimited final defensive fire against enemy units moving adjacent (though ASL(SK) adds extra detail (naturally!) that the defenders can also suffer harm on those defensive dice rolls). Conflict of Heroes can bring that effect into play by ensuring that a reserve of CAP's is kept right to the end of the round and that a few units remain unactivated, but this is a tactic that has to be learned and needs discipline to ensure it. Support weapons - Nicely represented in ASL(SK) with breakdowns, rate of fire and individual rules - such as how a demolition charge is used. Each weapon feels unique. I also like seeing the LMG teams in Conflict of Heroes. They add a good tactical feel and though they feel strong, this particular weapon was highly effective. Rout - I actually prefer the retreat rule in my own Tigers at Minsk for stopping players fighting to the last man and having losses degrade the side as a whole, leading to a general morale collapse and disordering perfect defences or lines of attack. Close Combat - They are all much of a muchness, except Retro is rather severe, but I particularly like the way that Band of Brothers does this. It feels measured and has some nice inter-play to the previous Rout Phase. Order of Battle - ASL(SK) is way out in front. The different states and types of squad is not matched and then there are the variety of support weapons, plus everything that comes with later games. Terrain - The sliding maps of Band of Brothers can cause an issue when testing lines of sight across map edges, making plexi-glass fairly essential. I like the distribution of terrain on the ASL(SK) maps. All the games have sensible and easy line of sight rules (note Retro use the LOS rules of the host system). Solitaire - Retro (and TaM) is the only one that does not really present any solitaire problems. The rest have some to various degrees. Decoys are the one area of Band of Brothers that annoys me the most. Conflict of Heroes gives the solitaire player extra things to do by having to manage two AP tracks. But as already stated, solitaire players are pretty good at getting around most things. Special Features - Probably Band of Brothers suppression and proficiency rules stand out the most here as being notable and effective for the lowest rules overhead. I hope this article has been of some interest. As stated, the narrow terms of reference makes such an article fairly superficial and many gamers will in any case have several different systems that they enjoy on their shelves. Sorry if your favourite system has not been mentioned (difficult within the limitations of a single blog article). I have not covered full ASL, the later ASLSK's, ATS or Panzer because they are a clear step up in size, scope and complexity. L'nL Band of Heroes system seems to somewhat straddle the two groups (though is often favoured as lighter complexity alternative to the bigger systems with a good narrative feel), so likewise has not been included here. Combat Commander does not have tanks, so while I happily play it with Mike and we enjoy our games, it will not lead me to my favourite level of play - combined arms, so has not been included here. I have enjoyed all the games played here and will continue to play all of the systems, but do I have a favourite? .... sadly no! at least not yet. Thanks for staying with this rather long post. LINK - ASLSK replay of the War of the Rats scenario. 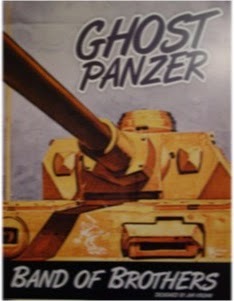 LINK - Ghost Panzer replay (tanks). LINK - Scenario conversion for Conflict of Heroes. Great post! Nice Christmas present. I currently favor Retro because of its scalabity and breadth. You get to use SL, AsL and Aslsk stuff. Huge scope of scenarios and every theater. You also can shift up from Retro to those more complex systems without buying anything more. Plus I like the Hesitation mechanic and the fact that movement comes before fire. You have to move not being sure if your comrades will break those units bearing down on you. Adds a great bit of fun and risk. I also prefer individual leader and SW counters, it personalized the game and makes me care more. More drama. Plus retro keeps the footprint small...no other boards, caps, cards, etc. To manage. So Retro is my favorite...atleast for now! Hi, Thanks. I have Valor of the Guards sitting on my shelf and I think the only way that I am likely to get that onto the table in the near future is via Retro. I have ASLSK Elst and am thinking about doing both a Retro and a Starter Kit campaign with it and then doing a comparison article, it would be interesting over the course of a longer game to see the outcomes. The Hesitation rule is inspired. I suppose we are lucky that there is so much choice. Mike is getting War Stories: Red Storm for Christmas - so yet another system for us to try out. I got an Amazon voucher so picked up 1 Hour Wargames by Neil Thomas on the Kindle. they are meant to be very (very) simple rules for figures on a 3' x 3' space, so I will give than an early go with my 10mm figures and just see how they pan out. I am wondering whether you realized that idea with Elst being played with Retro and ASLSK rules. Kudos and many thanks for your outstanding article "comparing-lower-complexity-tactical". Hi Mac, thanks, I am glad that you enjoyed the article, I have not done Elst yet, but in my 'cycle' of playing tactical games, I am back around to looking at ASL, so I hope to have a go at Elst. We moved home recently into something that has needed substantial renovation and unfortunately that has thrown a lot of my gaming activity out. I think it would be interesting if you compared these using armor, AT guns, mortars, and maybe fortifications, elevation, mines, snipers, aircraft. Hi Jim, there's a fair bit of work that goes into these things, so it will be a while before I do something like this again, but gun / armour systems do interest me enough to do that. I can't imagine how long that took you! I just thoroughly enjoyed it. There are many really good systems available today, each with its own strength. Excellent article....a complete delight for my Christmas. Thanks, motivated to read much more of your stuff....I very much like the way you did this--as others said, must have taken a lot of time, thanks for doing this! Thanks all. This particular post did take a lot of effort, but mainly because I had it all complete, ready for Christmas morning as promised, when I decided it was all a bit of a ramble without any structure. So I took it to bits and re-did it on the 23rd !, so through to Christmas Eve was quite fraught to get it finally done. Between the games I covered and those I left out, I agree, we have much to be grateful for in what amounts to a small niche hobby. Over on Consimworld, someone just reminded be that Barry Doyles' Valor of Victory would have been a good candidate to cover. It would have been nice to get a DTP game in there - though I am not sure whether Blogger limits the length of a post. I kept it mostly 'graphic free' just in case uploads had a limit. I actually love Valor and Victory. The only things holding it back are that it is presently going through a reworking, nothing major but it will change counters and it is hard to buy in until that is complete. Given this is a labor of love for the designer, it will take awhile. Second, there are limited scenarios and theaters. Sure you can design your own, but that really is not my bag. I wish a publisher would pick this up because it really is an awesome game and great design. Great post and very enjoyable to read on Xmas day. I've just seen a video preview of the CoH solitaire rules which look great and may tempt me in that direction. Your analysis of the base game is very helpful. Hope you enjoy the 1HW rules, they are really good at stimulating further thinking!. Great post. I have played ASLsince it's inception and your thoughts on the Starter system are very interesting and bring out the system well. I have played the Starter Sets scenarios with the full rules as there are some good ones in there. Solo of course. I have had the first two Convict of Heroes games for what seems ages and tried them several times but never got into them, but your post has re-ignited my interest. I have the March 2010 version of the rules but have asked Academy for latest ones. Firstly Norm, thanks for a post that are exactly the type I love to read - detailed comparisons of rules replaying similar scenarios. It has taken to now for me to get to read it but well worth it. I have a lot of ASL kit I got cheap (I played SL but only ASL a few times) and bought Retro a few years to give it go but the friend that is interested (ex-ASL player) and I just cannot seem to tee up a time. One Hour Wargames I find fascinating. Great read; thanks so much for taking the time to do this. This report was a great trip down memory lane as well as an introduction to new things. I played SL/ASL back in the 1980s, mostly by myself. I loved it at first but eventually grew weary of all the updates and the heavy rules. I probably would've loved the Starter Kits back then. I was away from gaming for many years, but I eventually got back into CoH (my go-to system) and then tried BoB (didn't connect with it). I think your analysis of both games is fair and spot on. I especially enjoyed the introduction to Retro you provided as I was not aware of that system, and the Hesitation mechanism does sound nicely streamlined. I think we're all spoiled with the luxury of arguing over which system is best as there weren't these many choices back in the 70s/80s when a lot of us started. So yeah, horses for courses indeed. I excitedly await the CoH solitaire system for a true AI to game against instead of "dealing with such things", and I wonder if it will convince people to adopt that system at least as their tactical solitaire game of choice. But really just wanted to thank you for the post and let you know I'll be looking forward to any more. Keep 'em coming. Thanks for a well reasoned and unbiased report. Great reading and makes me want to play a few games. Very interesting run through of those 5 tactical systems. Don't you find that having experience in many tactical games that you end up with what I call rule creep, bits of other games rule leak in into the current not intentionally, & never effects play. Hi, thanks for joining the blog. Interesting point. I'm sure there must be plenty of occasions that 'thinking' from one game can transfer to another. especially on rules such as say on line of sight rules which can be fundamentally similar across several formats. I generally tend to have a 'current favourite' that I am playing a lot of, rather than dipping into a different system every week, so that might help keep some clean breaks between the rules for me. Interesting to get this depth of comparison. 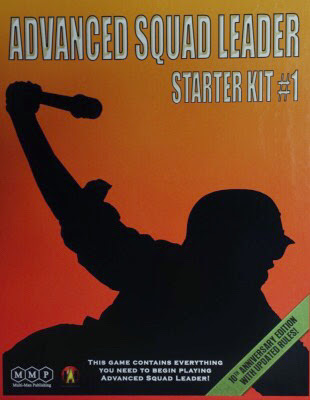 I was also interested to see how much the original Squad Leader design of counters has influenced the later games here as prior to the original SL lots of games just had tactical symbols while now artwork is common on unit counters at this level. Thanks, in some ways, I wish I had added a Lock 'n Load comparison, but perhaps the post is long enough as it is. I agree about the SL artwork, though interestingly SL / ASL have been locked into that design, while other companies have been able to take advantage of bigger counters and bigger, coloured images. In many respects, the same is true of the maps / boards, but I have a preference towards to old SL board artwork - maybe that is just a nostalgia thing, but some new systems seem to struggle with getting the right look for hills, while the old abstract method of SL seems to still do a pretty good job. Norm, with a growing interest in returning to ASL or something similar, I have read and re-read your excellent comparative work. I must say that this is simply a top-level study in comparing and contrasting the systems examined. Unfortunately, your comparison still leaves me wonder upon which path to tread. The SL series was a dear old friend of mine many, many years ago but I never advanced to ASL. ASLSK seems a good way to reintroduce myself to that system. The other systems sound interesting too and I am most interesting in giving TaM a try with my 15mm figures. For that, I need a larger hex, lots of terrain, and OBs for my early war collections. I have some work to do! Thanks again for an informative compare and contrast study. I like the ASL starter kits, though, they are designed to take you on a journey to the full rules and while you don't need to actually jump to the full rules, by the time you have all the modules, each would have progressively taken you to the point of that design cross over. So, while many will like ASK starter kit 1, they may enjoy starter kit (say) 3 less, even though they are still in the starter kit world. I am presently play GMT's Panzer, waiting for Lock 'n loads' Nations at War (just back in print) to be re-distributed, along with their actual Lock 'n Load tactical series. There really is just so much tactical goodness about.